I hope your weeks is going well. Mine has definitely gone by fast. Cory and I are heading to my family cabin this weekend- anyone else doing anything fun? Chloé is one of my favorite designers. The collection is always elegant, sophisticated with a boho aesthetic. Every piece is stunning, and one of a kind. I have the Chloé Drew Shoulder Bag (which was my very first designer bag I bought- actually Cory got it for me for our anniversary). I'm so so so excited to be sharing this post today because recently, Chloe sent me their new perfume, Absolu de Parfum! It also came with a mini crossbody bag, and the perfume fits perfectly inside of it. This bag is going to be perfect for going out or a music festival. I've been wanting to try their fragrance for quite some time now, and this present made me so happy. I wanted to share it all with you because I feel like it's a fragrance that needs to be talked about (and not this is not sponsored, I just love this scent). 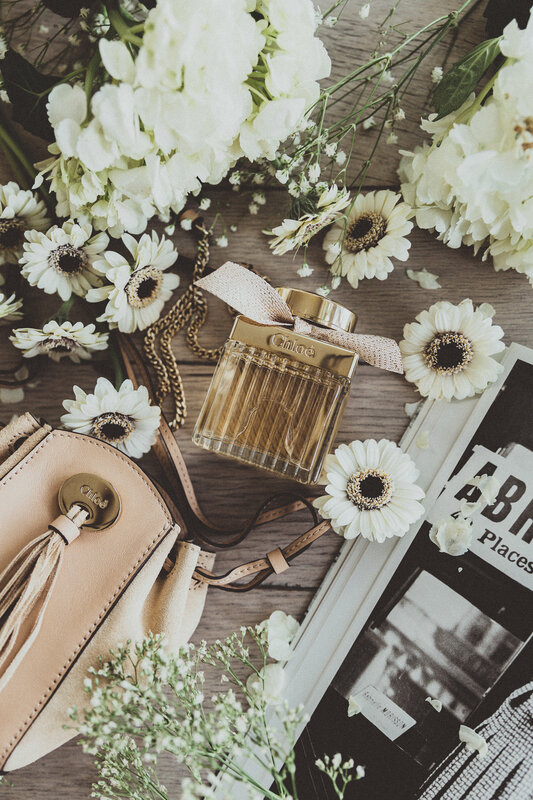 This new, exclusive fragrance by Chloé Fragrance was created in honor of their 10th anniversary of their signature, most popular fragrance Eau de Parfum. The top is dipped in 24 carat gold and tied with ribbon with gold details. It's a stunning and elegant bottle in itself, and one you could leave out on your vanity or somewhere on display. Absolu de Parfum is fragrance is a rich floral and woody fragrance. It has notes of damask rose, vanilla, patchouli. I'm going to be very honest here. This is my favorite fragrance I own right now. The smell is strong and fragrant, and lasts all day. I highly, highly recommend this fragrance! Would be a perfect Valentines Day gift for someone, or a perfect gift to treat yourself. The size I have is 2.5 oz. They also have it in a 1.7 size. You can shop the fragrance below! Thanks again Chloé! So happy to have this in my collection!